Thomas Horn, surrounded by posters of the missing, takes a moment of silence. Although I cried through the entire film and then for some time after the credits finished rolling, upon reflection, the only word I can think of to describe Extremely Loud and Incredibly Close is exploitative. A good music selection and shots of the burning Twin Towers led to an almost Pavlovian reaction in my tear ducts, but the actual heart of the movie speaks more to the American compulsion to create an unrealistic fairytale than to the actual tragedy of September 11. The film is based on the 2005 novel of the same name by Jonathan Safran Foer, which received mixed reviews and was also criticized for using 9/11 as an exploitative plot device. Although it’s mostly loyal to the book, the film loses several plotlines, characters, and a general sense of magical realism in favor of a more sentimental and concise style (though the film, at two hours and nine minutes, feels anything but concise). 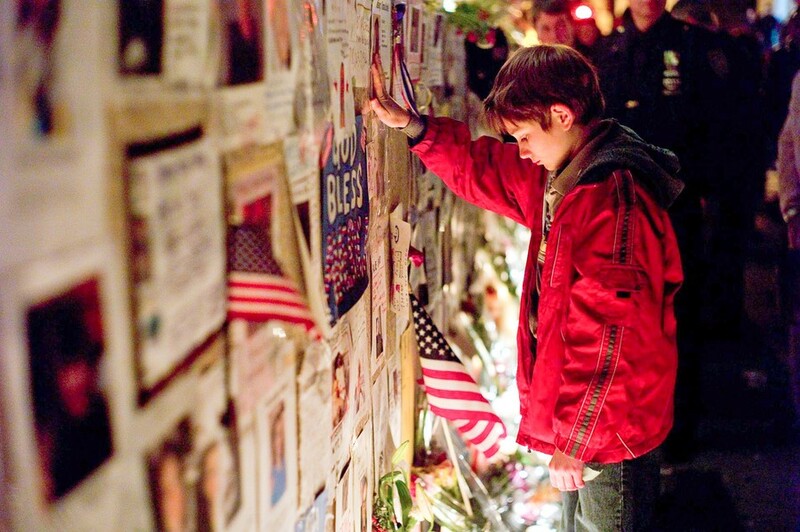 The film pivots around 11-year-old Oskar Schell (Thomas Horn), a quirky child from Manhattan’s Upper West Side who loses his father (Tom Hanks) in the terrorist attacks on the Twin Towers and doesn’t know how to manage his grief. A year after “the worst day,” Oskar finds a key in an envelope with the word “black” inside a blue vase in his father’s closet. He decides that “black” must be someone’s last name and sets out to find this person. It’s a venture meant to keep him close to his father before Oskar’s memory of him fades away completely—something the film gives away too easily. His journey takes him to every corner of New York and through it, Oskar learns to talk to people, take public transportation, and eventually—inevitably—let go. Oskar also meets his grandmother’s new “renter,” who is in fact his grandfather, Thomas Schell, Sr. (Max von Sydow). Schell lost his parents in the World War II bombing of Dresden and abandoned his son and wife due to his inability to manage his grief. He never spoke again after that, and communicates through written notes and hand signals. It’s a tale meant to weave together another story of loss and the ways in which one deals with it, but doesn’t quite succeed in communicating the complexity of grief. Horn plays a brighter, more child-like Oskar Schell compared to Safran Foer’s depiction in the novel, in a performance that is somehow both earnest and aware of this earnestness. In the book Oskar seems unusual (and like a possible stand-in for the author himself), but Safran Foer never explicitly declares that the character has Asperger’s Syndrome; the film, however, all but stamps the diagnosis on his forehead. Though he seems a bit old to play the father of a 9-year-old, the extremely likable Hanks inhabits the archtypal perfect father figure with gusto. Oskar’s mother (Sandra Bullock) plays the parent who was left behind and keeps her expressions of emotion understated, a noble and difficult task in a movie designed to be anything but unassuming. I won’t reveal the movie’s ending and say whether Oskar finds the owner of the key or not (hint: this movie is a fairytale…), but rest assured that lessons are learned, apologies are made, and frequent hugs are given. Even the film’s cinematography rests on the underlying premise of magical realism—every sound is magnified and every color brightened. Maybe these choices were meant to preserve the sense of whimsy in the original text, but they ultimately make the film seem even more juvenile and saccharine. Though the Academy doesn’t appear to agree (the film was recently nominated for Best Picture), Extremely Loud and Incredibly Close creates a fairytale out of the tragedy of 9/11. It leaves no questions unanswered and doesn’t let the senselessness of the terrorist attacks resonate. One might enjoy the film upon first viewing, but I dare audience members to retain warm feelings for 24 hours. In explaining away our grief through stories with happy endings, Extremely Loud and Incredibly Close belittles the magnitude of pain and bewilderment that arose from such a tragedy.